30th Annual Central Washington Sportsmen Show! The 30th annual Central Washington Sportsmen Show is set to open the doors Friday, February 15th at the Yakima Valley SunDome and it runs through Sunday, February 17th. 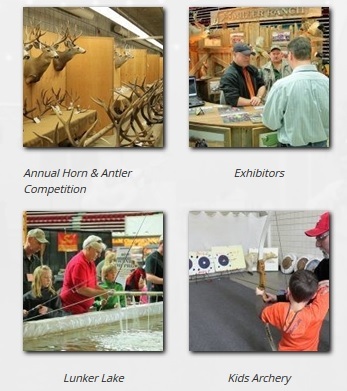 This always popular event brings area outdoor enthusiasts together, all under one roof, to see the latest in hunting and fishing gear, outdoor displays and exhibits, fishing boats, camper and camp trailers, ATVs, and much, much more. This year’s event will feature, for the first time, the West Texas Rattlesnake Show. Rattlesnake Dave Richardson collects all his snakes each year in Texas, then travels around the country performing at different locations. His collection of snakes will be on exhibit inside the Dome all three days for you to see. Plus there will also be several entertaining and informative presentations each show day. Also new this year will be the Yakima Bait Yard Sale. This lower valley fishing lure manufacturing company is very popular with area fishermen and will have their products at discount prices all three days of the show. They will be located on the west side of the main floor. Aspiring rock climbers will want to check out Ascending Adventures 24’ high climbing wall that will be set up at the SE corner of the Dome. The giant three-sided climbing wall is new to the show for 2019. This year’s show again has a full slate of hunting and fishing experts willing to share their knowledge each show day. Speakers at this year’s show include: Columbia Basin guide, Shelby Ross on Potholes Walleye; fishing expert, Rob Phillips on Kokanee destinations in Central Washington, as well as fishing the popular Lake Roosevelt for rainbows and over-sized Kokanee; Red’s Fly Shop covering fly fishing the Yakima River and mountain fishing in central Washington; fishing guide, Jacob Munden presenting spring and fall salmon fishing tips plus Columbia River walleye; WDFW’s Marc Divens with fishing opportunities around Central Washington; and river guide, Tracy Zoller giving tips on fishing the Klickitat River. For the hunters, shooting expert Jesse Redell will offer tips on long range shooting; and WDFW’s Aaron Garcia will cover bird hunting along with hunting clinics and hunter access in Central Washington. The 2019 Tour of the NW Big Game returns to the SunDome at the Central Washington Sportsmen Show with an impressive display of big game trophies taken in the northwest. This year’s display will include some of the largest elk and deer ever taken in the State of Washington. Also included in the display will be several life-size mounts of large predators such as wolves and cougars. The 4th edition of the Record Book for Washington Big Game Animals will be available at a special show price at the display. The 30th Annual Horn and Antler Competition, sponsored by Cabela’s, is always a big part of the show and is the only competition in central Washington where hunting trophies are scored, then displayed for all to see. The highest scoring trophies entered in the competition taken by archery, muzzleloader, and modern rifle during the 2018 season, will have a chance to win product from the Cabela’s Outpost in Union Gap. Also, the top scoring entries will be eligible for special prizes that will include Bushnell binoculars. Older entries can be scored and displayed, but are not eligible for “Best of Show” prizes. The 11th Annual Trout Races will take place again at the shows Casting Pool in the middle of the Dome. This entertaining race will have several contestants paired with a trout in the qualifying races with the winners of each heat moving on to the finals. The participating fish are released in a specially-built trout track and the first fish past the finish line is the winner. The competition is presented by KATS, KFFM, KIT who will give special prizes to the winners of the finals. The qualifying races will be held Saturday only at 3:00, with the finals to follow, all at the Casting Pool. Returning this year and also at the Casting Pool is the KXDD Casting Contest. This open competition will test the skills of all the contestants while using a push button spin cast rod and reel. A target will be set up at the dry end of the Casting Pool and each participant will be given three casts with the highest score winning. If there is a tie, a cast-off will be done to determine the winner. KXDD will pre-qualify the contestants and will furnish prizes to the winner of this year’s contest. For the fly fishing enthusiasts, there will be plenty to see and do during the three-day event. 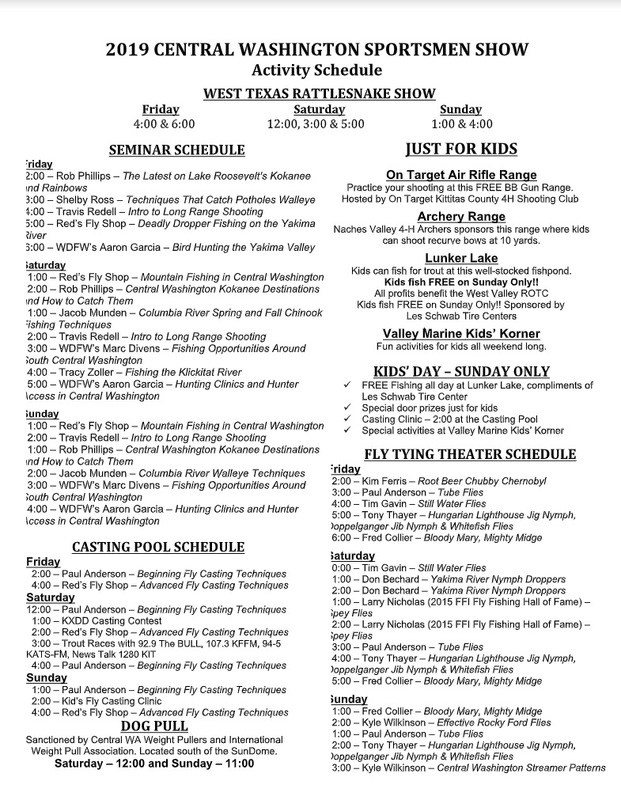 Red’s Fly Shop, and Paul Anderson of Fly Fishing Strategies Fly Shop in The Dalles, Oregon will be doing several fly casting demonstrations each day at the Casting Pool. These presentations will cover beginning as well as advanced casting techniques each day of the show. Experts will also be teaching how to tie their favorite flies at the Fly Tying Theater, plus anyone can sit down during the Fly Tying Clinic and, with expert instruction, learn how to tie their own fly from start to finish. Members of the Yakima Flyfishers Association will be tying different types of flies at the Fly Tying Theater during hourly presentations and they will also host the Fly Tying Clinic each day of the show. Outside the SunDome on Saturday and Sunday only, the Central Washington Weight Pullers will once again host a dog weight pull sanctioned by the International Weight Pullers Association. Since the pull is held outside at the south side of the SunDome, anyone can come and watch this event free of charge. There is always something for the kids to do at the show and this year is no exception. Kids can test their shooting skills at the Mt. Clemans Archers Archery Range and the On Target Air Rifle Range; fish for feisty trout at Lunker Lake; learn how to tie a fly at the Fly Tying Theater; learn how to cast a fly at the Kids’ Fly Casting Clinic; and try the new 24’ high climbing wall. On Sunday, “Kids’ Day,” every kid will be admitted to the show at a reduced rate and they can fish all day long at Lunker Lake free of charge, courtesy of the Les Schwab Tire Stores. Add that to several drawings just for kids and all the activities at the Valley Marine’s Kids’ Korner, and it will be easy for the kids to find something to do at this year’s show. As always, sportsmen show attendees will be able to save money on general admissions as well as have a chance to sign up for one of many door prizes. The Grand Door Prize this year, drawn Sunday at the close of the show, will be a $250 gift card from the Cabela’s Outpost in Union Gap. General admission is $10 for adults and $5 for children 6-12. Children under 6 are admitted free all three days of the show. Friday is Seniors’ Day with everyone 60 or older getting into the show for $5 and Sunday is Kids’ Day, where all kids ages 6-12 are admitted for $4 admission price. There is also a discount for all members of the military, which is $1 off any admission all weekend with their military ID. And there is a special return policy of pay the admission price once, get your hand stamped, then get back into the show the rest of the weekend. For those willing to come early, a special prize awaits them on all three days of the show. On Friday and Saturday, the first 150 adults through the door will receive a bag of stuff from Oak Creek ACE Hardware. And on Sunday, Kids’ Day, the first 100 kids will receive a goody bag courtesy of the Central Washington Sportsmen Show. Show hours are Friday 1:00 to 7:00; Saturday 10:00 to 6:00; and Sunday 10:00 to 5:00. Parking is at a reduced rate of only $4.00 per day all three days of the 2019 Central Washington Sportsmen Show courtesy of Shuyler Productions.